Berea (Beroea; Modern Verria or Verroia — population 38,000) is located about 47 mil. [75 km.] west of Thessaloniki — about a three day walk. Paul, Silas, and Timothy came here after having been driven out of Thessalonica. Here their message was well received as the Jews examined the scriptures daily to see if their message was true (Acts 17:11). 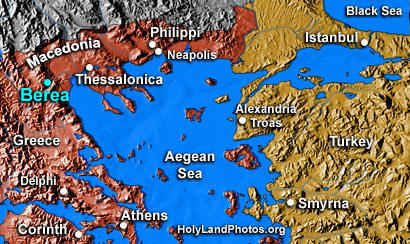 Many Jews and Greeks — women and men — were converted to the new faith, but Jews from Thessalonica came to Berea and as a result, Paul left for Athens. Among the remains pertaining to the Paul’s visit to Berea are commerative mosaics, a street from the Roman Period, and possibly the location of the synagogue of Berea.